I started this self-imposed project to challenge my creativity and get engaged again in the photography world after a bit of a sabbatical. So I finally decided to move this activity to this blog space. Over time I will post all the prior iPhone photos onto this blog and I will post each daily photo here also. I plan to also include some occasional how-to tips and descriptions for select photos and a few of my personal thoughts once I get going. 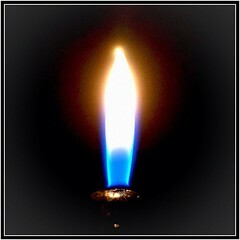 Just an iPhone photo of the flame on a BIC barbecue lighter in front of a black background. Processed with the Filterstorm and PhotoStudio app for cropping, framing, contrast and saturation adjustments.